For the Welsh Liberal politician, see Jasper Wilson Johns. For the English soccer player, see Jasper Johns (footballer). For the non-fiction book by Michael Crichton, see Jasper Johns (book). In 1958, gallery owner Leo Castelli discovered Johns while visiting Rauschenberg's studio. “And we went down," Castelli remembered. "And then I was confronted with that miraculous array of unprecedented images -- flags, red, white and blue... All white... Large ones... small ones, targets... numbers, alphabets. Just an incredible sight... Something one could not imagine, new and out of the blue." Castelli immediately offered Johns his first solo show. It was here that Alfred Barr, the founding director of New York's Museum of Modern Art, purchased four works from this show. In 1963, Johns and Cage founded Foundation for Contemporary Performance Arts, now known as Foundation for Contemporary Arts in New York City. Early works were composed using simple schema such as flags, maps, targets, letters and numbers. Johns' treatment of the surface is often lush and painterly; he is famous for incorporating such media as encaustic and plaster relief in his paintings. Johns played with and presented opposites, contradictions, paradoxes, and ironies, much like Marcel Duchamp (who was associated with the Dada movement). Johns also produces intaglio prints, sculptures and lithographs with similar motifs. Johns makes his sculptures in wax first, working the surfaces in a complex pattern of textures, often layering collaged elements such as impressions of newsprint, or of a key, a cast of his friend Merce Cunningham's foot, or one of his own hand. He then casts the waxes in bronze, and, finally, works over the surface again, applying the patina. Flashlight is one of his earliest pedestal-based sculptures. One sculpture, a double-sided relief titled Fragment of a Letter (2009), incorporates part of a letter from Vincent van Gogh to his friend, the artist Émile Bernard. Using blocks of type, Johns pressed the letters of van Gogh's words into the wax. On the other side he spelled out the letter in the American Sign Language alphabet with stamps he made himself. Finally, he signed his name in the wax with his hands in sign language. Numbers (2007) is the largest single bronze Johns has made and depicts his now classic pattern of stenciled numerals repeated in a grid. Since 1960 Johns has worked closely with Universal Limited Art Editions, Inc (ULAE) in a variety of printmaking techniques to investigate and develop existing compositions. Initially, lithography suited Johns and enabled him to create print versions of iconic depictions of flags, maps, and targets that filled his paintings. In 1971, Johns became the first artist at ULAE to use the handfed offset lithographic press, resulting in Decoy — an image realized in printmaking before it was made in drawing or painting. However, apart from the Lead Reliefs series of 1969, he has concentrated his efforts on lithography at Gemini G.E.L. In 1976, Johns partnered with writer Samuel Beckett to create Foirades/Fizzles; the book includes 33 etchings, which revisit an earlier work by Johns and five text fragments by Beckett. He has also worked with Atelier Crommelynck in Paris, in association with Petersburg Press of London and New York; and Simca Print Artists in New York. In 2000, Johns produced a limited-edition linocut for the Grenfell Press. In 1973, Johns produced a print called Cup 2 Picasso, for XXe siècle, a French publication. For the May 2014 issue of Art in America, he created a black-and-white lithograph depicting many of his signature motifs, including numbers, a map of the United States and sign language. For decades Johns worked with others to raise both funds and attention for Merce Cunningham's choreography. He privately assisted Robert Rauschenberg in some of his 1950s designs for Cunningham. In spring 1963, Johns helped start the Foundation for Contemporary Performance Arts, then intended to sponsor and raise funds in the performance field; the other founders were John Cage, Elaine de Kooning, the designer David Hayes, and the theater producer Lewis B. Lloyd. Johns later was the Merce Cunningham Dance Company's artistic adviser from 1967 to 1980. In 1968 Johns and Cunningham made a Duchamp-inspired theater piece, Walkaround Time, in which Johns's décor replicates elements of Duchamp's work The Large Glass (1915–23). Earlier, Johns also wrote neodada lyrics for The Druds, a short-lived avant-garde noise music art band that featured prominent members of the New York proto-conceptual art and minimal art community. In 1964, architect Philip Johnson, a friend, commissioned Johns to make a piece for what is now the David H. Koch Theater at Lincoln Center. After presiding over the theatre's lobby for 35 years, Numbers (1964), an enormous 9-foot-by-7-foot grid of numerals, was supposed to be sold by the center for a reported $15 million. Art historians consider Numbers a historically important work in part because it is the largest of the artist's numbers motifs and the only one where each unit is on a separate stretcher, fashioned from a material called Sculpmetal, which was chosen by the artist for its durability. Responding to widespread criticism, the board of Lincoln Center had to drop its selling plans. In 1998, the Metropolitan Museum of Art in New York bought Johns' White Flag. While the Museum would not disclose how much was paid, The New York Times reported that "experts estimate [the painting's] value at more than $20 million". The National Gallery of Art acquired about 1,700 of Johns' proofs in 2007. This made the gallery home to the largest number of Johns' works held by a single institution. The exhibition showed works from many points in Johns' career, including recent proofs of his prints. The Greenville County Museum of Art in Greenville, South Carolina, has several of his pieces in their permanent collection. 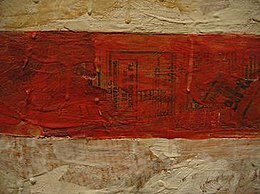 In 1980 the Whitney Museum of American Art paid $1 million for Three Flags (1958), then the highest price ever paid for the work of a living artist. In 1988, Johns' False Start was sold at auction at Sotheby's to Samuel I. Newhouse, Jr. for $17.05 million, setting a record at the time as the highest price paid for a work by a living artist at auction, and the second highest price paid for an artwork at auction in the U.S. In 2006, private collectors Anne and Kenneth Griffin (founder of the Chicago-based hedge fund Citadel LLC) bought False Start (1959) from David Geffen for $80 million, making it the most expensive painting by a living artist. On November 11, 2014, a 1983 version of Flag was auctioned at Sotheby's in New York for $36 million, establishing a new auction record for Johns. In "Mom and Pop Art", a 1999 episode of the animated television series The Simpsons, Johns guest stars as himself. ^ Solomon, Deborah (7 February 2018). "Jasper Johns Still Doesn't Want to Explain His Art". Retrieved 8 February 2018. ^ Georgian Encyclopedia.org, New Georgia Encyclopedia 16 January 2009. ^ Vaughan, David (27 July 2009). "Obituary: Merce Cunningham". The Observer. ^ "The Flags of Jasper Johns". The Attic. Archived from the original on 2018-07-27. Retrieved 27 July 2018. ^ Finkel, Jori. Artist Dossier: Jasper Johns. May 2009, Art+Auction. ^ Betti-Sue Hertz. “Jasper Johns' Green Angel: The Making of A Print” Resource Library (San Diego Museum of Art) January 29, 2007. ^ a b c Vogel, Carol (February 3, 2008). "The Gray Areas of Jasper Johns". New York Times. Retrieved 2008-02-03. ^ a b Jasper Johns: Numbers, 0–9, and 5 Postcards, November 2, 2012 – January 5, 2013 Matthew Marks Gallery, Los Angeles. ^ Jasper Johns, Flashlight (1960/1988) Archived 2009-04-25 at the Wayback Machine Walker Art Center, Minneapolis. ^ Jasper Johns: New Sculpture and Works on Paper, May 7 – July 1, 2011 Matthew Marks Gallery, New York. ^ Jasper Johns: Prints 1987 – 2001, April 24 – June 7, 2003 Gagosian Gallery, London. ^ Gemini G.E.L. : A Catalogue Raisonné, 1966–2005 | Jasper Johns National Gallery of Art, Washington D.C.
^ Johns: The Prints, February 2 – April 13, 2008[permanent dead link] Madison Museum of Contemporary Art. ^ "Sun on Six by Jasper Johns on artnet Auctions". Artnet.com. 2012-05-12. Retrieved 2013-12-05. ^ Jasper Johns, Cup 2 Picasso (1973) Christie's London, September 16, 2009. ^ Carol Vogel (April 17, 2014), Art as Magazine Insert New York Times. ^ Alistair Macaulay (January 7, 2013), Cunningham and Johns: Rare Glimpses Into a Collaboration New York Times. ^ Julie Belcove (April 29, 2011), Meaning in the making Financial Times. ^ Frank DiGiacomo (January 18, 1999), Art in the Gilded Age: Lincoln Center Czars Hang Up Jasper Johns New York Observer. ^ Carol Vogel (January 26, 1999), Lincoln Center Drops Plan to Sell Its Jasper Johns Painting New York Times. ^ Vogel, Carol (October 29, 1998). "Met Buys Its First Painting by Jasper Johns". New York Times. New York Times. Retrieved 2008-02-28. ^ Brett Zongker (March 6, 2007). "National Gallery to Get Jasper Johns Prints". The Associated Press. Retrieved 2008-04-16. ^ "Book of Members, 1780–2010: Chapter J" (PDF). American Academy of Arts and Sciences. Retrieved June 2, 2011. ^ "National Medal of Arts". The National Endowment for the Arts. Retrieved October 20, 2013. ^ "SkatePress.com". SkatePress.com. Archived from the original on 2012-09-19. Retrieved 2013-12-05. ^ RITA REIFPublished: November 11, 1988 (1988-11-11). "Jasper Johns Painting Is Sold for $17 Million – New York Times". Nytimes.com. Retrieved 2013-12-05. ^ Jori Finkel (May 14, 2009), Jasper Johns BLOUINARTINFO. ^ "Rothko, Jasper Johns star at NYC art auction". businessweek.com. Archived from the original on 14 November 2014. Retrieved 14 November 2014. ^ "Most expensive living artist at private sale". Guinness World Records. Retrieved 19 September 2017. ^ "JasperJohns Target with Four Faces 1955" (with image), moma.org.. Retrieved 2015-09-13. ^ Cotter, Holland (21 March 2014). "A Lens Catches; a Painter Converts". The New York Times. ^ ""The Simpsons" Mom and Pop Art (TV Episode 1999)" – via www.imdb.com. Castleman, Riva. Japser Johns: A Print Retrospetive. The Museum of Modern Art 1986. Johns, Jasper; Varnedoe, Kirk; Hollevoet, Christel; and Frank, Robert. Jasper Johns: Writings, Sketchbook Notes, Interviews, The Museum of Modern Art, 2002 (out of print). Kuspit, Donald (2010). "Jasper Johns: The Graying of Modernism". Psychodrama: Modern Art as Group Therapy. London: Ziggurat. pp. 417–425. ISBN 9780956103895. Weiss, Jeffrey. Jasper Johns: An Allegory of Painting, 1955–1965, Yale University Press, 2007. Yau, John. A Thing Among Things: The Art of Jasper Johns, D.A.P./Distributed Art Publishers, 2008. Wikimedia Commons has media related to Jasper Johns.